The trial of accused Boston Marathon bomber Dzhokhar Tsarnaev has been delayed yet again on account of a snowstorm expected to soon blanket the region. 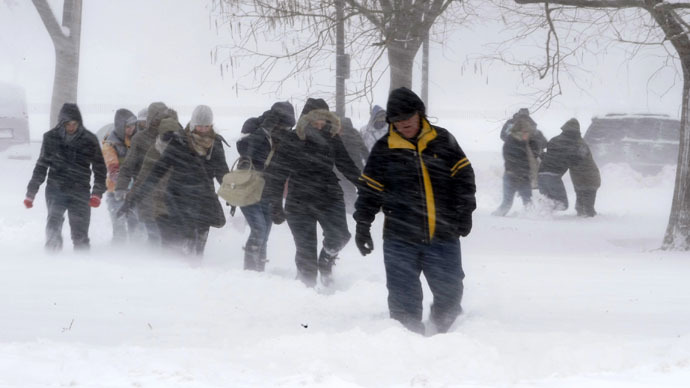 Jury selection in the high-profile terrorism case was expected to resume on Monday, the Associated Pressreported, but was called off in the morning after weather forecasters predicted upwards of a foot of snow in Boston, Massachusetts for that evening. Boston’s Logan Airport was operating at 50 percent capacity, a transportation spokesperson told Boston.com, and major airlines had begun canceling flights early Monday ahead of the expected storm. Court proceedings have been held up in the Tsarnaev case as a result of weather two weeks in a row, further delaying opening proceedings for a trial nearly two years in the making. Tsarnaev, 21, is accused of plotting and participating in the April 15, 2013, bombing that killed three people and injured more than 250 others during the annual footrace. Authorities say he acted with his older brother, 26-year-old Tamerlan Tsarnaev, in detonating two bombs near the Boston Marathon finish line, in turn launching a multi-day manhunt across New England. Tamerlan Tsarnaev died during a confrontation with police on April 19, 2013, and authorities soon after captured the younger brother and charged him with terrorism-related offenses. In January 2014, federal prosecutors said they’d seek the death penalty if Dzhokhar Tsarnaev is convicted by a jury. More than one year later, though, and nearly two years after being captured, the trial has hardly gotten off the ground. Defense attorneys representing the bombing suspect have filed multiple motions in an attempt to delay the trial and unsuccessfully argued last August that hearings should be put on hold until at least September 2015 due to the “massive amount” of evidence involved. Tsarnaev’s counsel also asked previously asked that the their client be tried outside of Boston due to “an overwhelming presumption of guilt in the District of Massachusetts,” and last month argued that the recent terrorist attack at the Charlie Hebdo office be considered by the court as reason to further delay the trial because it placed the marathon bombings "at the center of a grim global drama." Tsarnaev’s trial officially got under way on January 5, but has moved at a snail’s pace since. More than 1,350 prospective jurors filled out lengthy questionnaires during the first week, WCVB News reported, and opening statements scheduled for last Monday have yet to occur as a result of a jury selection process now nearly one month-old. According to the AP, more than 100 prospective jurors have been questioned as of this Monday, but finding the final few in charge of weighing Tsarnaev’s fate will now wait until the expected snowstorm subsides.